May 9, 2013  Tina Gordon Chism's directorial debut Peeples opens in theaters tomorrow, and she came in to tell Tell Me More's Michel Martin about its real-life familiar premise: meeting your significant other's family for the first time. 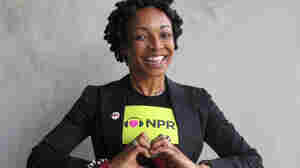 On her way out, she took a minute to show some love for NPR. 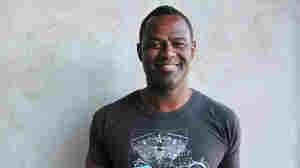 April 8, 2013  R&B musician Brian McKnight came by to talk to Tell Me More host Michel Martin about his evolving songwriting process and his feeling that he's made too many albums. 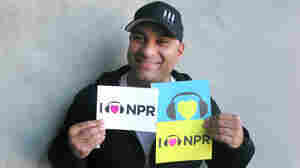 March 6, 2013  Comedian Russell Peters spoke to NPR guest host Celeste Headlee for an interview on Tell Me More. And while he tells us that he gets his news from the The Daily Show, Peters makes a headline today for his NPR love. February 18, 2013  Reginald Hudlin produced Quentin Tarantino's Django Unchained, and talked with Tell Me More guest host Celeste Headlee about the changing film industry. On his way out, he showed us some NPR love. January 30, 2013  Al Roker, popular weatherman for NBC's Today show, has a new book called Never Goin' Back. 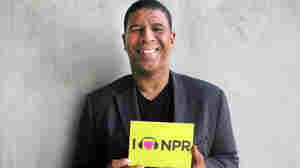 He stopped by NPR NY to talk with Tell Me More Host Michel Martin about the motivation behind his latest project and spread some sunshine with his infectious smile and NPR love. January 21, 2013  Nashville-based gosepl singer Vicki Yohe recently stopped by NPR for a performance chat with Tell Me More Host Michel Martin. 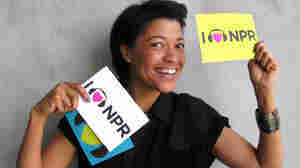 After performing a few of her popular sings, Yohe took to the 88 keys to showed her love for NPR. January 15, 2013  Ozomatli has always made danceable, family-friendly music, and now they've got an album out just for kids, that parents will like, too. 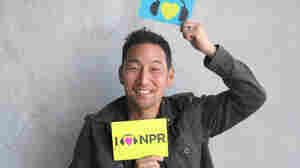 Hear band member Jiro Yamaguchi talk to Tell Me More host Michel Martin about the album Ozomatli Presents OzoKids, and see him sport some NPR love. 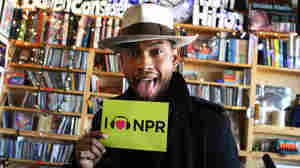 January 8, 2013  R&B singer Miguel saved some love for NPR during a visit to our headquarters. There he played a Tiny Desk Concert for NPR Music and shared his story with Tell Me More Host Michel Martin. January 2, 2013  Director Cameron Crowe and saxophonist Trevor Lawrence talked to NPR guest host Celeste Headlee on the 40th anniversary of Marvin Gaye's only film score, for the movie Trouble Man. And though neither of the two is used to being in front of the camera, they had no trouble posing to show NPR love. December 26, 2012  Director Peter Ramsey is the first African American to direct a big-budget computer-generated (CG) animation movie. 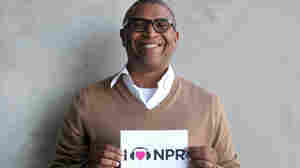 He talked to NPR Host Michel Martin about directing the holiday movie, Rise of the Guardians, and on his way out, gave us a big smile to show some NPR love that's not CG at all. 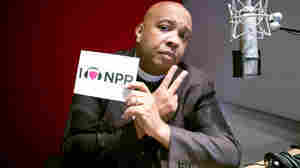 December 19, 2012  Hip-hop-artist-turned-pastor Rev. 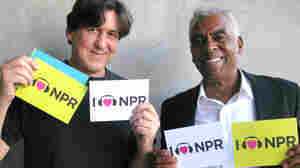 Run stopped by NPR to talk with Tell Me More Host Michel Martin and send some NPR pride our way. December 4, 2012  Grammy-winner Siedah Garrett co-wrote Michael Jackson's mega hit "Man in the Mirror." Garrett spoke with Tell Me More host Michel Martin about trying to keep her composure while talking to the king of pop as "Thriller" turned 30 last week. November 23, 2012  Danica McKellar, a.k.a. Winnie Cooper, joined Tell Me More to talk about an amazing math teacher she had in middle school, using Barbie to explain ratios and why kids had to sneak her book into school with them. Luckily, she loves NPR, and this doesn't require any math at all. September 14, 2012  NPR's Tell Me More is holding a Twitter Education Forum (#npredchat) to engage influencers, policymakers, journalists, and activists, and most importantly educators, parents, and students – in a continuing conversation about education reform. June 29, 2012  Comedian Gabriel Iglesias, who appears in the new film Magic Mike, gave guest host Viviana Hurtado some laughs in an interview on yesterday's Tell Me More. 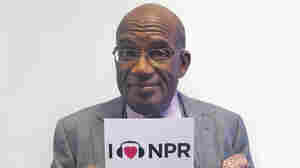 All jokes aside, Gabriel loves NPR.